I have what could be called a little obsession with Cary Grant. When I’m having a bad day, there’s nothing like watching one of his comedies to cheer me up. So when I saw that his former home in Palm Springs, California, was on the market, I had to check it out! The 1927 Spanish-style house sits on 1.54 acres and was Grant’s Hollywood hideaway for 20 years. Cary Grant’s daughter Jennifer (whose mother is Dyan Cannon) wrote a book about her famously private dad. He retired from acting at the age of 62 to focus on being a father. If you read Rob Lowe’s memoir, he has a great story about what it was like to date Cary Grant’s daughter. 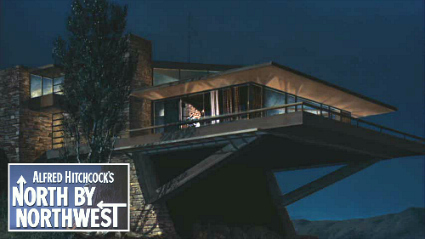 The guest wing was designed by Wallace Neff, who was also responsible for Reese’s country house. The house has 6 bedrooms, 5.5 baths, and 5 fireplaces. Want it? The asking price for this piece of movie-star history is $2.9 million. For more photos and information, check Zillow. Wow! So much charm and the price is right! Love how welcoming it feels. Great find, Julia. I want that house! In a different location, besides the bathroom I wouldn’t change a thing. Where do I get 2.9 million from? I think they could have staged the house differently. It’s way too busy with colors and patterns. The bathroom is awful. I don’t like those steps. Oh I love the bathroom! I would give anything to have that tile in my home today. I love the patterns all throughout the house as well. Funny how we all have different tastes and views on things. Thanks Julia for the find. I enjoyed it so much. I love Cary Grant. That house looks so comfortable. My 8 year old daughter said it reminds her of the house in the original Parent Trap movie. My favorite Cary Grant movies are Charade with Audrey Hepburn and Walk, Don’t Run, which I think may have been his last movie. My favorite Cary Grant movies are the ones he made with Irene Dunn; My Favorite Wife, The Awful Truth and Penny Serenade. I can imagine Cary in this house. It’s rustic like the cottage at the end of My Favorite Wife. Love that house. Great antiques like the tiger maple four poster bed. Love your commentary & more fun that the Zillow site. I love this house. It looks so cozy. 🙂 i like this house…. I love Cary Grant, and ‘His Girl Friday’ is one of my all time favourite films. And I’m pleasantly surprised by his house too, looks like a normal (y’know, for a movie star) family home. I just love to “tour” with you! Your posts are always sure to bring a smile to this house lovers heart! Have a super Thursday! It’s a beautiful house! I don’t like the wild west interiors, but I love the architecture! Love this house – and Cary Grant! 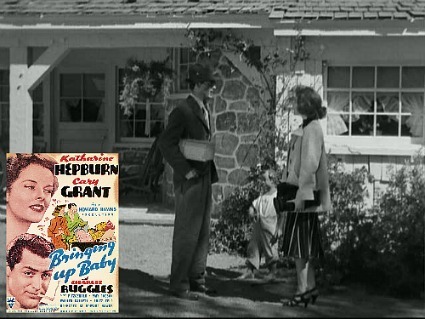 I think ‘His Girl Friday’ and ‘Bringing Up Baby’ are my favorites. You could say the previous owners went a little overboard with their love of Southwest decor (looks like they also must have loved dalmatians), but it suits the home’s era. And I agree, that green tile is awesome. Once the furniture was moved out, I don’t think I’d change a thing! This house looks like such a classic…so relaxing and welcoming! I think you and I were seperated at birth. I love Cary Grant! I think he is one of my favorite movie stars. The true “Hollywood Star” was Cary Grant. Now movie stars are lacking that sophistication. I love this house. It is so simply decorated but still packs a punch. This is how decorating should be! It doesn’t take potted plants, photos, and quoted signs hanging on walls to make a statement. The outside of the house reminds me of a house that was from a movie he was in……I have to remember which one! beautiful…love cary grant too…who couldn’t? he was gorgeous, funny and so talented…that house is the perfect blend of old and new…thanks for sharing! I don’t like the furniture – way too old fashioned – but the house itself is beautiful. I read an interview with Cary Grant’s daughter, and it seems like he was a great great dad and person. 🙂 I love the “bones” of his home. Southwestern decor isn’t my thing, but they made it lovely! i adore palm springs. i can see myself padding around that house. love it! his daughter is gorgeous…wowza! I adore Cary Grant and I love that house. I never would have guessed what the inside looks like from the first picture either. I have an awesome studio picture of Cary Grant, Katherine Hepburn and the leopard from Bringing Up Baby courtesy of a friend whose aunt was the leopard’s trainer. How do you get a job like that*? Where do you even get a leopard? * Actually my dream job is to be a food critic. Getting paid? Yes, please! LOVE the bathroom, those art deco baths are so beautiful and so different from the ‘so blah spa’ look that’s popular now. Love the approach to the swimming pool..totally welcoming and relaxing. If that’s a picture of his daughter, she got the best of both parents. Beautiful woman. Cary Grant is my absolute favorite!!!! I’ll forever be madly in love with him. No one will ever have that debonaire air about them like he did. Thanks so much for feeding my obsession with this post on his house!!!! Wonder what the kitchen looks like? I think it’s terrific just the way it is…wouldn’t change a thing. And now you have me heading for my Netflix account to add to my queue…yay! Ahhh….love him! I agree with the down-to-earth comfy comments about his house…and certainly wouldn’t mind redecorating it! “Charade,” “Walk Don’t Run,” and “Father Goose” are three of my Cary Grant favorites. Thank you for sharing this! Oh…and I love the cobblestone breezeway! I love Cary Grant’s movies. Some of my favorites are: “Houseboat”, “That Touch of Mink”, “Charade”, and more. I especially love in “That Touch of Mink”, when Doris Day’s character got to try on any dresses that she wanted. Oh how I wish I could go back in time just so I could try on some their outfits. Cary Grant was asked to play James Bond, but he declined. Just think how awesome it would have been to see him play that character? He would played that part perfectly. Oh well, we have the other James Bonds to watch. What a great house. Looking at the outside, you wouldn’t think it would be this warm and cozy inside. That’s why I love it. This house would make a great vacation home. Etta took the words out of my mouth – I’m not sure about the interior style, but I love the basic bones of the place. Pillow Talk has always been one of my favorties.. This house looks like him.. charming and relaxed.. He had this flair that was never unaproachable.. I love homes like these, so warm and inviting. Love this post. The house is beautiful! Looks so warm and comfortable. The outside is quaint too. It reminds me a little bit of the house in It’s Complicated. Love the blue shutters too. We enjoy watching his movies too!! How fun! To Catch a Thief. Best. Movie. Ever. Oh, and I also love that bathroom! Gosh, no love for Philadelphia Story or I was a Male War Bride? Count me in among the Cary Grant fans. I adore the house. I was just thinking that if you must have a great room, it should be as cozy and comfortable as this one. Lovely house. Great house and the Spanish Revival furniture is just right for it. It gives it a real Molesworth feel. Finally I see someone has nearly as many vintage California tile top tables as I do. Wow. 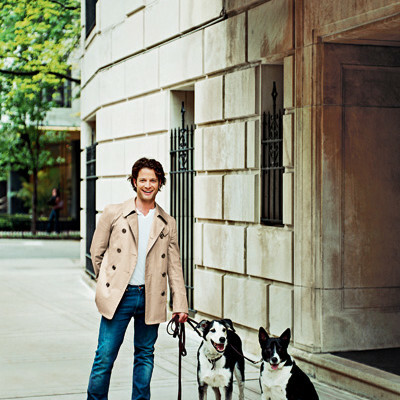 I would love to own his house. I’m off to learn more about this book. Love this house! My friend Jane Cowles Smith is the one who did it; and is selling it! You have fabulous taste in houses!! Ah yes, I have a Grant obsession, too. There’s never been anyone better!! Huge Cary Grant fan here. Surely you have seen Mr. Blandings Builds his Dream House, with Myrna Loy. If not, you must watch it now. I love that tunneled entrance and, even though they might seem dated, the green tile in the bathroom. I just did a post on my favorite Cary Grant movies and fell upon you site! This post is brilliant! This is a beautiful home, however I would have expected Cary Grant to have a bit more of an extravagant taste when is comes houses. He has been one of my favorite stars for 60 years.